Bunny Kingdom is a drafting game, and so the basic structure of its four rounds is pretty clear. At the start of a round each player is dealt a hand of twelve cards in a three player game or ten cards with four players. (You can play with two players, but how cards move around is a bit more complicated then. ) Each player picks two cards they will want to play, the rest they pass on. Then they play the two cards they chose, pick up the cards they got from their neighbor, and repeat until all cards have been used up. Cards come in four basic flavors. The most basic are territory cards showing a set of coordinates. 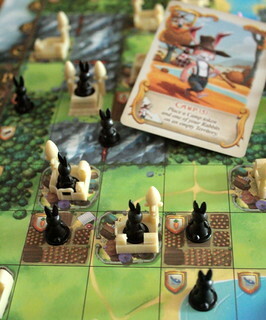 When you play them you put on of your adorable bunny miniatures on that space on the game board. Building cards let you put improvements on your territories in the construction phase. Parchment cards stay secret until the end of the game when they are worth extra points. Finally, there are a few Provisions cards that let you immediately draw two cards from the draw pile and play both of them. When all cards for the round have been played you enter the construction phase, where your building cards become actual buildings on territories you control. Cities come in three levels and increase the Strength of your fiefs by one, two or three points. Farms increase the Wealth of your fief. A fief, by the way, is an area of adjacent territories you control. Unless you place a pair of Sky Towers, they merge two fiefs into one. Camps let you take possession of a territory without the proper card for its coordinates. Useful, but they have a downside: If another player later comes along with the right card for that territory they can kick your camper bunny out again. It’s an easily overlooked rule that placing buildings in the construction phase is voluntary. You may leave building cards in front of you and place the building in a later round. It sounds like a minor rule, but it makes a pretty big difference on the sliding scale between luck and strategy. After all construction is done comes the moment everyone’s waiting for. The Harvest. The Phase When You Score Points. You score points for each of your fiefs separately. A fief’s value is its Strength multiplied by its Wealth. Strength is simply the sum of all city levels in the fief. Wealth is the number of different resources produced in that fief. Most territories produce one type of resource already. Forests produce wood, ocean spaces produce fish. (What do bunnies do with the fish, anyway?) Farms produce another resource in addition to the territory they are placed on. One or two farms make a big difference. 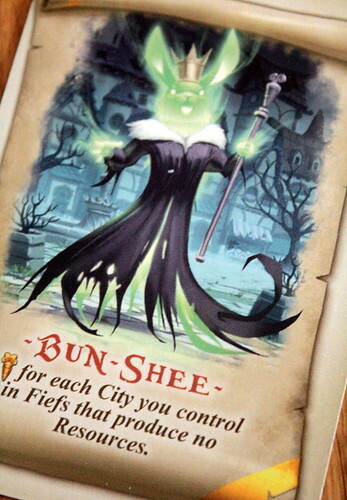 The four Harvests are your main source of points, but a surprise is always possible when players reveal their parchment cards at the end of the game. Those cards either show treasures or famous characters like the imposing barbunian chief Harecingetorix. Some of those cards have a big impact on your score still, and on your strategy as well if you get them early enough. Take Harecingetorix, for instance. He awards you a point for each of your fiefs. Many small fiefs suddenly sound a lot more attractive, don’t they? I mentioned the sliding scale from luck to strategy somewhere up there. It’s that nasty thing that gives Bunny Kingdom a bit of trouble, unfortunately. You make many strategic decisions with your card drafting and building placement, but bad luck may rain on your parade more than in other drafting games. The problem are the territories and how you draft them. Sometimes you just don’t get territories that connect with each other. Or you do, but they are all forests. And when you finally connect two of them with a camp do create a somewhat valuable fief someone takes over your camp with the correct territory card. Bad luck like that doesn’t happen every game, but it happened more than once in our tests, and when it happens it’s frustrating. A matter of taste, of course, but for many Bunny Kingdom might be too random for a gamer’s game and too complex for a family game. Personally, I love playing Bunny Kingdom, but even I had games when all I wanted afterwards was to eat rabbit. However, if the luck/strategy balance doesn’t upset you, or in the many games where no one is extraordinarily unlucky, Bunny Kingdom has a lot to offer. As a drafting game it’s very quick with almost no downtime for anyone. Players can do almost anything in parallel. Things only slow down a bit for the Harvest, and even counting points is quick enough. There’s also a very comfortable level of interaction. That’s usual for drafting games, you always control what your neighbors get. 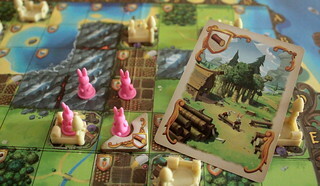 In Bunny Kingdom this part is especially smooth, that’s the upside of the board and territory cards. Even with a quick glance at the board you can have a good estimate how valuable a card is to your opponents. Deciding if keeping that card from them is more valuable than playing a card that benefits yourself more is still not easy, but easily seeing what the others are up to helps the interaction a lot. A final thing that deserves a mention is the design. We’re used to beautiful, high quality productions from IELLO, but the illustration of Bunny Kingdom by Paul Mafayon are outstanding. 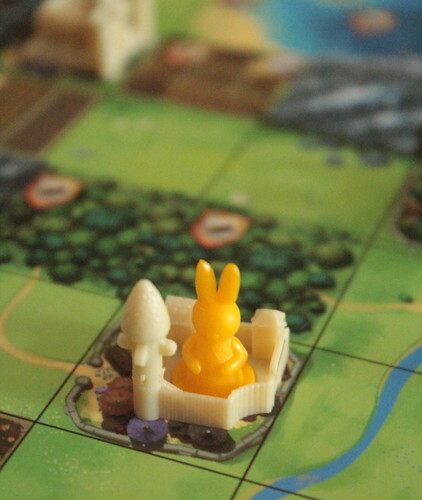 I would’t hesitate to hang a Bunny Kingdom art print on the walls of the Meeple Cave, and if Monsieur Mafayon decided to make a Bunny Kingdom graphic novel I’d be first in line. Despite an unfortunate flaw, Bunny Kingdom is the kind of fun game I can play again and again.